Knopf Publishing Group, 9780307701558, 288pp. The most celebrated and controversial French novelist of our time now delivers his magnum opus—about art and money, love and friendship and death, fathers and sons. 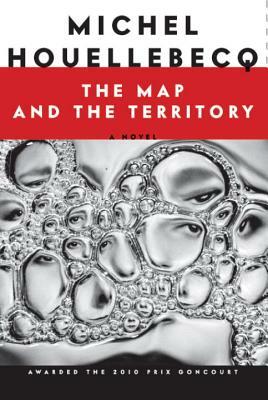 The Map and the Territory is the story of an artist, Jed Martin, and his family and lovers and friends, the arc of his entire history rendered with sharp humor and powerful compassion. His earliest photographs, of countless industrial objects, were followed by a surprisingly successful series featuring Michelin road maps, which also happened to bring him the love of his life, Olga, a beautiful Russian working—for a time—in Paris. But global fame and fortune arrive when he turns to painting and produces a host of portraits that capture a wide range of professions, from the commonplace (the owner of a local bar) to the autobiographical (his father, an accomplished architect) and from the celebrated (Bill Gates and Steve Jobs Discussing the Future of Information Technology) to the literary (a writer named Houellebecq, with whom he develops an unusually close relationship). Then, while his aging father (his only living relative) flirts with oblivion, a police inspector seeks Martin’s help in solving an unspeakably gruesome crime—events that prove profoundly unsettling. Even so, now growing old himself, Jed Martin somehow discovers serenity and manages to add another startling chapter to his artistic legacy, a deeply moving conclusion to this saga of hopes and losses and dreams. Already honored with the Prix Novembre and the International IMPAC Dublin Literary Award, Michel Houellebecq won the Prix Goncourt for "The Map and the Territory" in 2010.